Prayer flags flutter at a notch in a jagged, rocky ridge. Our group of Sherpas and foreign trekkers has trekked carefully down the narrow track made slippery by snow, ice, and mud. 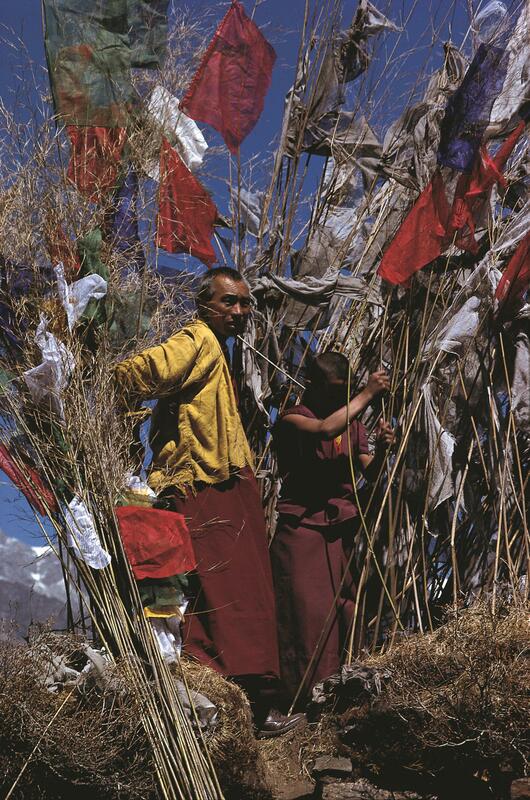 At the pass is a cairn with prayer flags, a labtsa. Each Sherpa companion places a small stone from the path onto the cairn, giving thanks that our trekking group has safely finished this part of our journey. I follow suit. Further down the trail, we turn our backs to gusts of wind. In the fury of blowing dust, we hide our faces inside our jackets. Though I see only the ground before me, a vision fills my mind — a hard impact on the back of my head, and then a sudden void. In that instant, a thick board blown off a nearby hut hits the back of my ankle. Shocked, I feel the pain in my ankle ebbing with the realization that the board would have struck my head if I had not stepped forward. “The flood reminded us to cherish our land. It was going to happen, but very few people were killed. 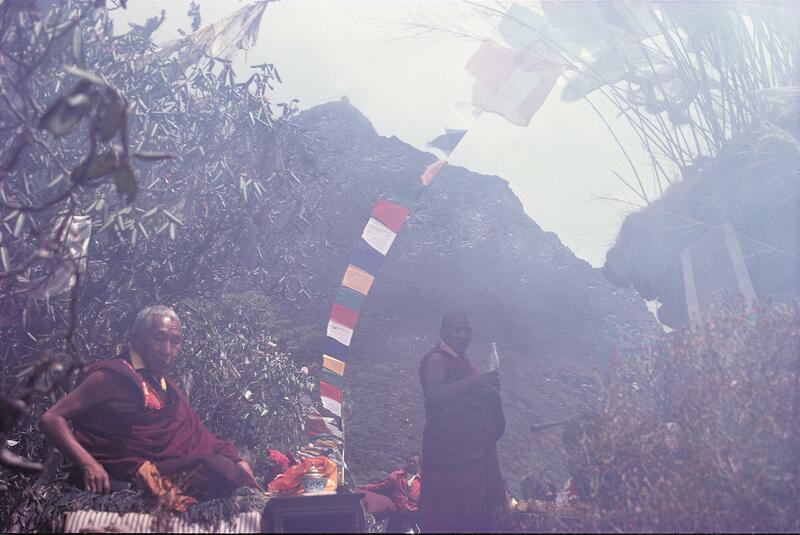 Perhaps Khumbila’s influence held the flood until a day when many people were at a festival high in the yak pastures. Imagine if the flood had happened in October when the trails by the river would have been crowded with Sherpas, porters, and trekkers. Khumbila protected us from that disaster. As a Westerner, I had tried at first to intellectually understand this other way of seeing the world. Being with people with different perceptions and assumptions, I gradually learned to perceive and accept other cultures and ways of life. The total immersion in Sherpa culture led not to a rejection of my culture, but to a realization that other ways of being work for people in different geographic situations. The people of the Himalaya believe the mountain peaks, ridges, passes, fields and homes are the abodes of deities representing the power of the place. The prayer flags, ceremonies, and little rituals of everyday life in these places acknowledge some greater power. The Sherpas’ lives embrace extremes: folk belief and a profound spirituality, loneliness and social obligation, deprivation and abundance. The existence of one extreme doesn’t rule out the possibility of its opposite. 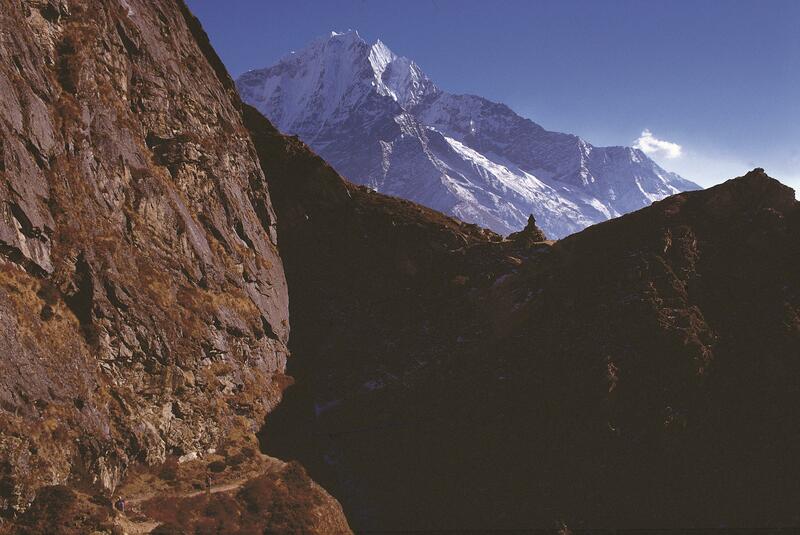 For the Sherpas, Khumbila is the short name of the Khumbu-yul-lha, “Khumbu country- god”. He is the protector of the land, people, and religion of the Khumbu. 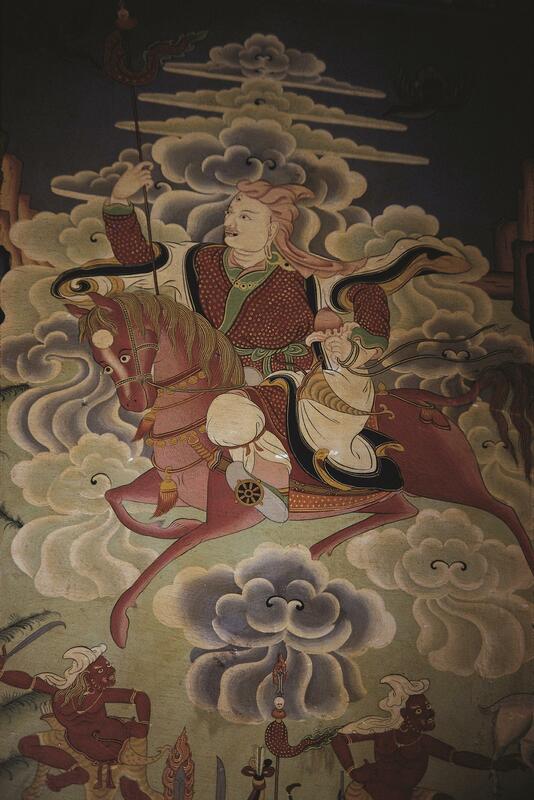 He is shown riding a great white horse and carrying a tall banner. 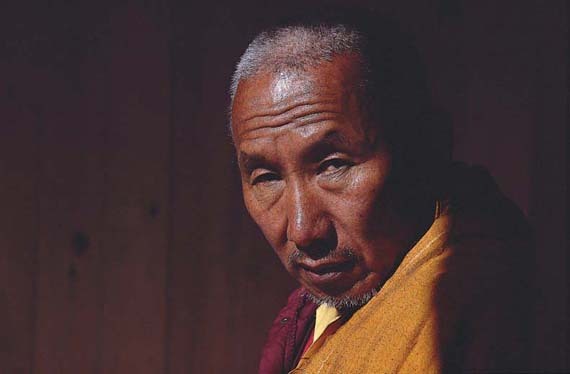 Rinpoche says, “Khumbila wears the traditional turban-like headgear that men wore in the old days. Rinpoche tells how the Sherpas’ ancestors brought books from Tibet describing the mountain and a valley that would be a refuge for people fleeing trouble in Tibet. At the centre of this valley is the mountain Khumbila, the abode of the protector deity. Jomo Miyo Langsangma resides on Everest. Legends say this goddess distributes wealth and good fortune. In modern times, expeditions and treks to Everest have brought affluence to many Sherpas. At the start of each expedition, Sherpa crews perform rituals to appease the goddess before entering her abode. 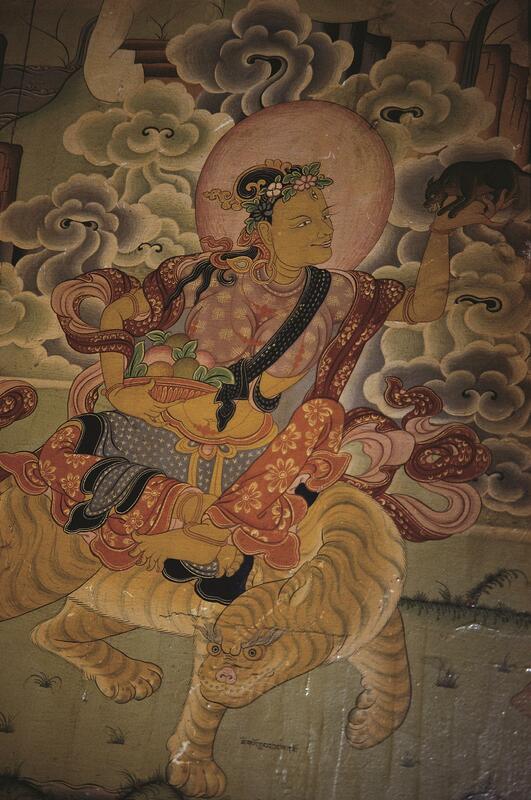 The Tengboche monks are conscious that the ridge where the monastery sits is the abode of a minor female deity, a lhamo. This day is the annual ritual at the cairn on the ridge to honour the goddess of this place. The ridge above Tengboche is 3,000 feet higher than the main Khumbu villages and surrounded by mountains. It rises from forestedslopes to a jagged summit plastered with finely fluted snow. At a low crest of the ridge is a large cairn with prayer flags. This lhapso is a monument acknowledging the power there. Today, the monks are preparing new flags to place on the lhapso. In the gonda courtyard, two monks are printing flags. The first monk brushes ink onto a wooden block etched with the reverse image of a religious image. 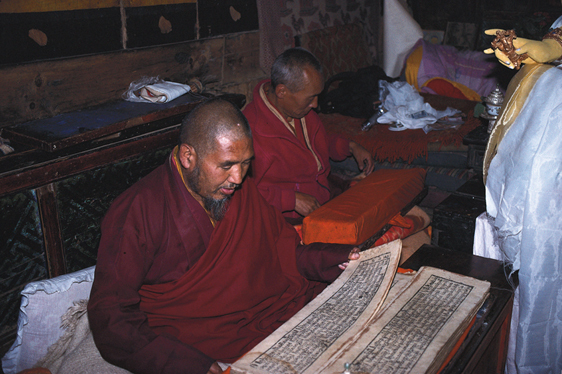 He positions a piece of cotton on the block and holds it in place while the other monk runs a roller over the cloth. The image prints onto the fabric. Two older monks stitch the flags onto long bamboo sticks. Two young monks bound back into the courtyard after the twenty-minute trip up and down the mountainside to deliver flags to the lhapso site. Each boy grips another armload of bamboo poles against his chest, gingerly balancing the sticks twice as tall as themselves. As they scuffle up the hill, they are careful not to desecrate the flags by letting them touch the ground. Monks carry low tables, cushions, ritual instruments, and Thermoses of tea up the ridge. They arrange the cushions and tables along the edge of the forest. 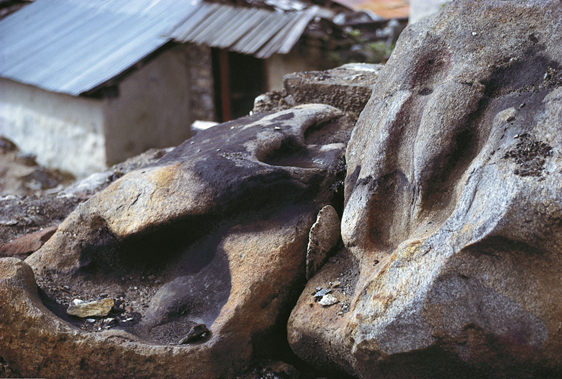 A middle-aged monk places sculptures of tsampa (barley flour) and butter, called torma, on a ledge on the cairn. The flat ground by the lhapso becomes an outdoor temple. This lhapso is a stone and plaster cairn six feet high. 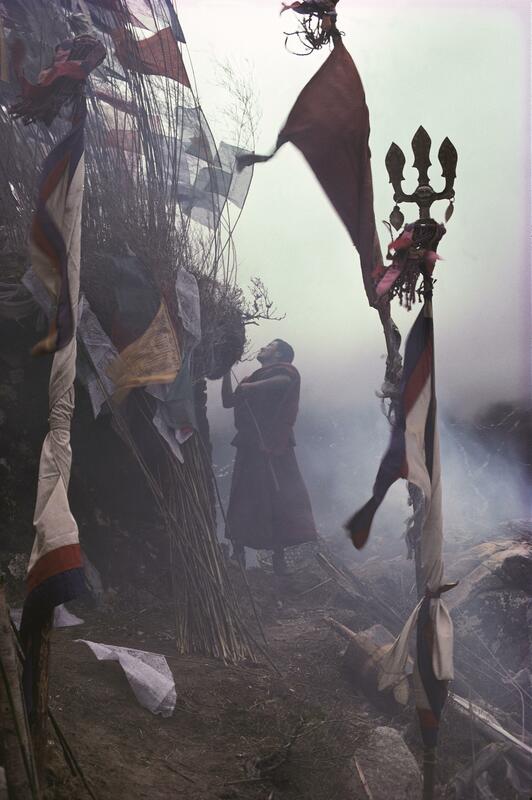 Standing on top, the prayer leader removes old flags and carefully pushes the new flags’ bamboo poles into its earthen top. 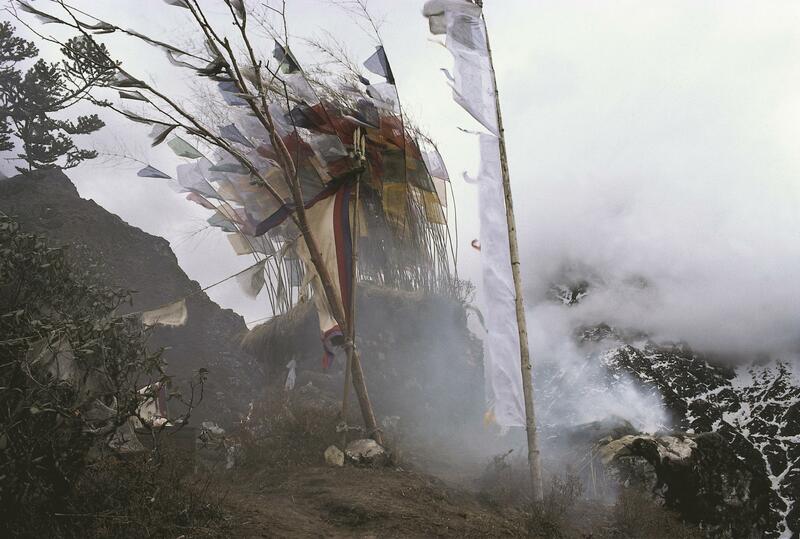 Other monks pile the old flags and green juniper boughs onto a smouldering fire. Fragrant smoke billows from the juniper. It signals that the ceremony is ready to start. Half an hour later all the monks finally arrive at the site. 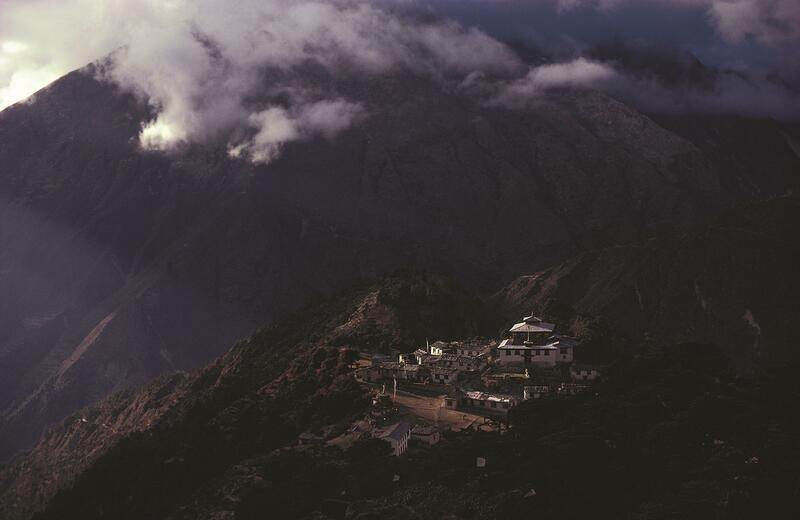 The monks sit facing Khumbila to the west, across the gorge from Tengboche. Behind them, large yellow rhododendron blooms cover the trees. The monks blow horns, clatter cymbals, and chant prayers to the deity of the ridge, who personifies the power of this place. Creating harmony with the environment through prayers at Tengboche It is not easy living in these mountains. On the narrow trails or in the fields, the immense power of the land can harm or kill. 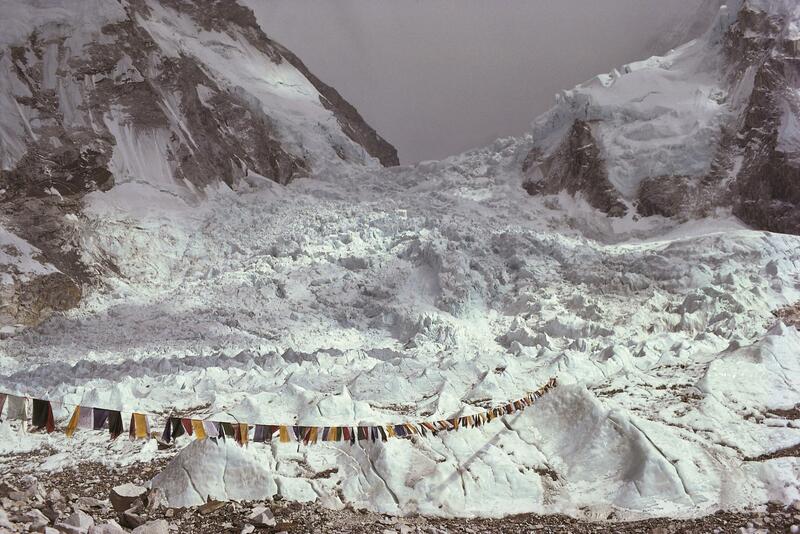 Sherpas do not tame nature; they accommodate this power that is beyond their control. Ceremonies to harmonize humans and nature give people a way to understand their environment. Sherpas explain the power of their environment through a view that everything exists in two forms: the physical and the spiritual. They may see a god either as a real personality living on a mountaintop or as a symbol of nature’s power. 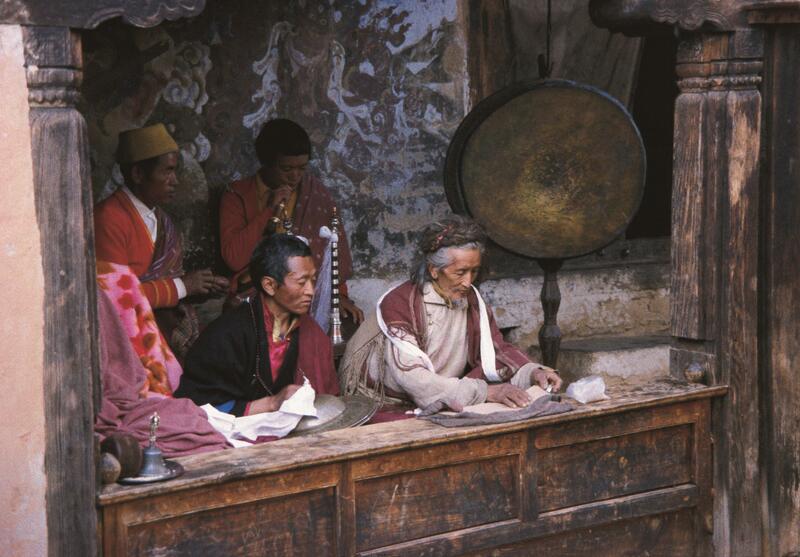 Their beliefs embrace tiers of explanations with deeper and deeper meanings, but all these rituals and objects of everyday life — the ceremonies, prayer flags, and Mani stones — acknowledge some greater power. The ritual on the mountainside draws to a close, as the monks’ prayers and horns merge with the whistle of the wind. Smouldering juniper incense mingles with wispy clouds condensing around the mountainside. 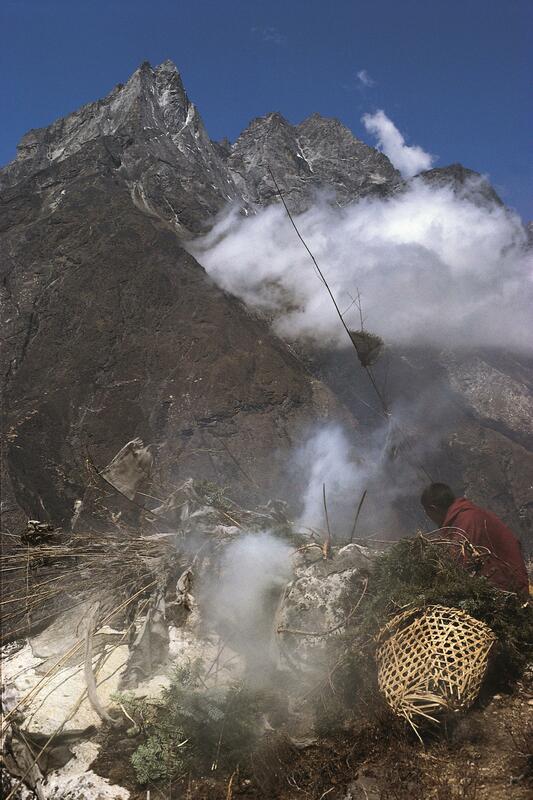 Smoke from juniper incense mingles with clouds above Tengboche. As chants and wind seem to merge the metaphysical and the everyday, I appreciate that moment when a metaphysical being might have intervened in my everyday life. 1 Thubten Jigme Norbu and Colin Turnbull, Tibet: Its History, Religion, and People, Penguin Books, 1968. Pg. 32.